The Argument for Freezing Credit: Is Your Social Security Number Easily Found on the Web? You’ve likely heard about the recent security breaches at popular stores like Target, Neiman Marcus and Michael’s. While it’s bad enough that so many customers’ security was compromised, what’s even worse is the reports that these customers’ personal and credit information often ends up on a large database to be bought by criminals for as little as $40. You might imagine some shady database that is hard to find unless you’re a criminal. Unfortunately, the truth is that your personal information is surprisingly easy to find on the web. While I didn’t turn up anything amiss with the home, I was shocked when I happened upon a site that touted itself as a reverse social security number look up. The address I was searching was there, complete with the owner’s social security number. In fact, every social security number that was listed had either the number holder’s full name or address. The simple truth is, no matter how cautious you are about not sharing your social security number or making sure to shred all documents containing your personal information, you can’t control all aspects of that information. If you’re living a normal life and using a credit card or debit card, you might be the victim of a company’s security breach (even though you did everything right to protect your identity). Your own information could very well end up on the web even if you’re diligent about not having a web footprint. My friend recently had her identity stolen. She found out fairly quickly–within 3 days, but by then the thief had already charged over $20,000. She’s spent hours trying to clear her name while also caring for her 5 young children during the day. I can’t imagine the stress she’s under right now. Truth is, that could happen to any of us, especially when our personal information is so freely available on the web. If you want to protect your name, identity, and credit score, the best way to do so is to freeze your credit. First, to clear up a misconception, if you freeze your credit, the credit lines you already have open will not be affected. You can use your credit as normal with no inconvenience. However, freezing credit does have a few inconveniences. If you want to open a new line of credit or even apply for a new apartment, for instance, you’ll need to thaw your credit. Depending on the state you live in, this can cost anywhere from $2 to $10. 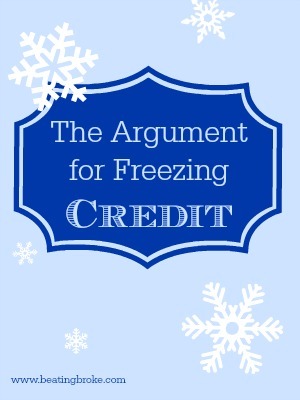 Initially freezing your credit also costs about $10 per credit bureau. My husband and I have had our credit frozen since 2009 when we had our eBay account hacked and $1,000 was purchased over night. I plan to keep our credit frozen for the rest of our lifetimes, thawing only when needed (like we did a few weeks ago to pre-qualify for a home loan), especially now that I know social security numbers and other personal information are so easy to find on the web. Have you frozen your credit? If not, would you consider doing so?